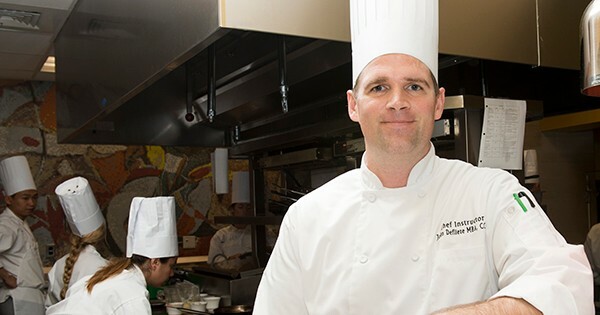 The University of Delaware’s student-operated restaurant Vita Nova is excited to welcome Chef John Deflieze, who joins UD’s Department of Hospitality Business Management as an executive chef after 14 years at Le Cordon Bleu College of Culinary Arts in Scottsdale, Az. Deflieze will be working alongside of Executive Chef Joe DiGregorio. For a large portion of his career at Le Cordon Bleu, Deflieze was chef de cuisine of the student-operated restaurant Technique, similar to Vita Nova. 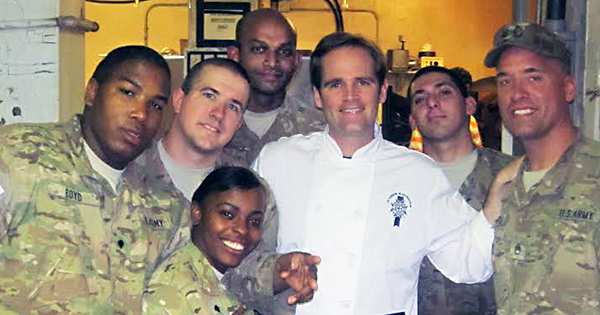 In 2011, New Vita Nova Chef John Deflieze traveled to Afghanistan to cook Thanksgiving dinner for active service members. In 2011, Deflieze traveled to Afghanistan with other professional chefs to cook Thanksgiving dinner for active service members. He recalls this an extremely rewarding experience and said that he appreciated having this opportunity to serve the community. Deflieze said that he would describe himself as a classically trained French chef. Before joining UD, Deflieze and his wife traveled to Europe for six months so he could gain firsthand European cooking experience. He believes that using fresh ingredients is one of the most important aspects of great cooking. “I love just really fresh ingredients, organic and locally sourced, and ingredients that are in season,” he said. Deflieze also discussed some of the projects that he is most excited to work on with UD students. “For October for breast cancer awareness month [we’ll be making] pink chocolates [to give] to the guests at the end of their meal,” he said. Some of Deflieze’s other responsibilities at UD will include instructing HOSP325, the quantity food service management lab. In this lab, students are responsible for running the lunch buffet, Monday through Friday, at Vita Nova. He will also be co-instructing HOSP489, Restaurant Management Practicum II. This class is the fine dining lab, during which hotel, restaurant and institutional management (HRIM) students work in Vita Nova’s main restaurant. Deflieze added that he is especially excited to be working with Executive Chef DiGregorio.